Though tragedy has wrecked her life, Allie Siders holds on to the hope that her five-year-old daughter, Betsy, will speak again. But with a stalker out for revenge, all Allie can think about now is their safety. She must sever all ties and abandon life, as she knows it. She heads to the peaceful Bluebird Ranch, nestled deep in Texas hill country, and to the only person who can help them. The ranch is a sanctuary for abused horses, and also for troubled youths: the perfect place for Betsy to grow and recover. Ranch owner Elijah DeAngelo eagerly welcomes the duo. But Rick Bailey–the ranch foreman and DeAngelo’s right hand man–hasn’t decided to let his guard down . . . yet. 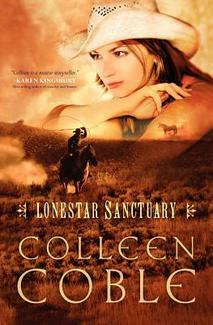 This is the first book in Coble’s Lonestar series. Since I read Lonestar Secrets last year some time and really enjoyed it, I decided to grab the book that started the series. Coble has done a great job of showing the reader the land Allie and Rick reside in. I felt drawn in by the dusty, isolated land where mountains and sky meld together. It is a hard land but it offers sanctuary to Allie when she needs it the most. Rick Bailey is a man haunted by his past mistakes. At the same time he is dealing with a past filled with bitterness. He found his sanctuary at Bluebird Ranch two years ago. Ever since he has been helping abused horses and troubled youths heal from the knocks life has thrown them. When Allie Siders and her daughter Betsy appear looking for their own sanctuary, Rick has to learn to put aside his preconceived notions about Allie and her situation in order to try and help her. Rick indeed rises to the challenge in more ways than he expected. Allie is a woman tired from the blows life has struck her in the past twelve months. She longs for her daughter to speak and for a place to finally call home. As she struggles to protect her daughter from the danger chasing them, she is finally given the chance to lean on someone other than herself for a change. I have discovered an interesting trend with regard to my character preference with Coble’s novels. I have read seven of her books and enjoyed them all. When I think back through the Coble books I’ve read, I realize that I definitely find her heroes are the ones that really grab my attention! Having said this, I enjoy the heroine’s in Coble’s novels and I’m always rooting for them to solve the mystery and they are likeable women. I just like the guys more I think! Maybe Coble just knows how to create a guy that resonates with my own idea of what a Christian man should be. It also might be that she writes a great looking guy! I really loved getting lost at Bluebird Ranch and am looking forward to reading more in this series.